The rivalry between Enzo and Jacques, two childhood friends and now world-renowned free divers, becomes a beautiful and perilous journey into oneself and the unknown. Smyrna 1922: In her youth, Roza, a descendent of a wealthy family, is married in haste. Athens 1987: Roza lives with her granddaughter, carrying a closely guarded secret. A collector discovers in a Turkish antique shop a vintage wedding dress stained with blood that leads him to the enigmatic Roza, and the unveiling of a love story from the tragic past. Raised on hip-hop and foster care, defiant city kid Ricky gets a fresh new start in the countryside. He quickly finds himself at home with his new foster family: the loving Aunt Bella, the cantankerous Uncle Hec and their dog Tupac. When tragedy strikes that threatens to ship Ricky to another home, both he and Hec go on the run in the bush. As a national manhunt ensues, the newly branded outlaws must face their differences and survive as a family. Courgette is an intriguing nickname for a 9 year old boy. Although his unique story is surprisingly universal. After his mother’s sudden death, Courgette is befriended by a kind police officer, Raymond, who accompanies Courgette to his new foster home filled with other orphans his age. Courgette struggles at first to find his place in this strange, at times hostile, environment. Yet with Raymond’s help and his newfound friends, Courgette eventually learns to trust, find true love and at last a new family of his own. Gathering in the parched concrete wasteland of Athens’ crumbling Olympic village, a group of teenagers engages daily in boisterous horseplay. The eldest of them, doe-eyed Anna (Dimitra Vlagkopoulou) and timid Dimitri (Dimitris Kitsos), begin courting and soon become a couple. Coming alive in each other’s company, they explore the attractions of a seaside tourist resort with gleeful curiosity and juvenile excitement. Yet with the passing of time, their relationship goes from summery bliss to autumnal anguish, and the impact of the social body on the individual is keenly, painfully felt. a scrappy, one-of-a-kind dog that will change his life forever. Guillaume Canet is told by a young co-star that he's no longer Rock'n' Roll and can't sell films anymore. He then tries to prove her wrong and gets help from his girlfriend, Marion Cotillard. Centaur is a quiet, small and modest man, a loving father of a little boy that has never spoken a word and the husband of young, deaf-mute Maripa. Together they lead a simple life in a small village of Kyrgyzstan. Centaur is above all a respected man among his neighbours, a man beyond any suspicion, but he has a belief deeply rooted inside him. He still believes that Kyrgyz people once united and invincible thanks to their horses, have been punished by Heavens for misusing that power to achieve their mercenary goals. Beyond any suspicion, Centaur becomes a horse thief, as he thinks only a genuine racer riding at night and praying for forgiveness can write off the curse. But his well-hidden secret cannot be kept for long. When the truth shines, he will need to decide the destiny of his family, co-villagers and his own. A middle-aged man walks around virtually empty streets; it’s unclear whether they’re empty because it’s the middle of freezing winter, or if the decrepit town really is as abandoned as it looks. He tries to sell his wares to the few passers-by. Encouraged to sniff the soap he carries in a suitcase, they get a big surprise: Most immediately fall to the ground, unconscious, allowing their money and valuables to be pocketed by the devious salesman. If they fail to pass out, or otherwise create a problem, he’s got a handgun to encourage cooperation. A United Kingdom is based on extraordinary true events. In 1947, Seretse Khama, the King of Botswana, met Ruth Williams, a London office worker. The attraction was immediate: she was captivated by his vision for a better world, he was struck by her willingness to embrace it. Both felt liberated by the social upheaval that followed the war - Seretse sensed the opportunity for change as the Empire weakened, Ruth saw the possibility for a “bigger life” as women pushed for independence and equality. They were a perfect match, yet their proposed marriage was challenged not only by their families but by the British and South African governments. The latter had recently introduced the policy of apartheid and found the notion of a biracial couple ruling a neighbouring country intolerable. South Africa threatened the British: either thwart the couple or be denied access to South African uranium (vital for the British nuclear program) and gold (vital to replenish reserves following the war) and face the risk of South Africa invading Botswana. Despite the terrible pressures they faced, Seretse and Ruth never wavered - they fought for their love every step of the way, and in so doing changed their nation and inspired the world. At the Aegean Film Festival we felt we could not ignore the current debate about classic versus new forms of online distribution and the way the latter is affecting the film festival world. 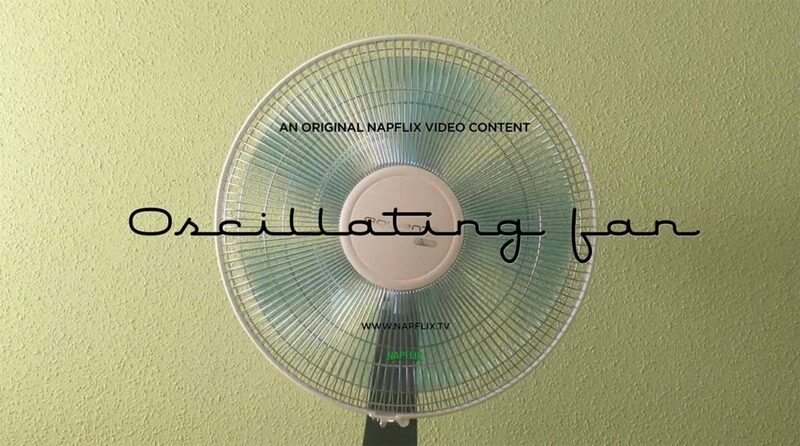 In the midst of this heated debate we have decided to partner up with Napflix to bring you something that will cool you down, a Napflix original, the Oscillating Fan. A whole ten hours of an oscillating fan, can you endure it? We challenge you to remain awake for as long as you can, and the last one standing will receive a great gift… the fan itself!